While I was researching the Nursery Web Spider, I came across information on the Bowl-and-Doily Spider, a name which is sure to catch the attention of a textile aficionado such as myself! 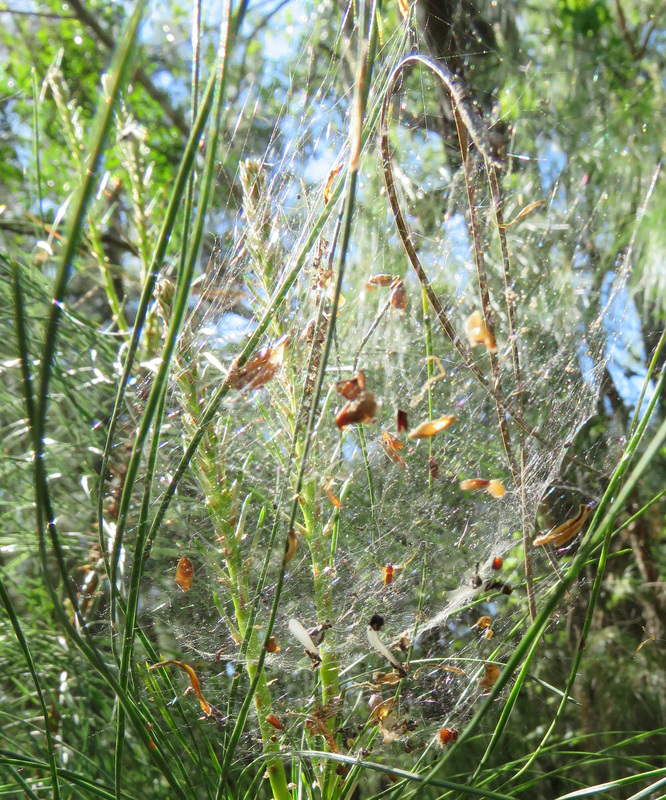 From the guidebook description, I realized that I had seen these webs out in the woods, so I went looking for them. Distribution: From coast to coast within the United States. Remarks: Length 4 mm. 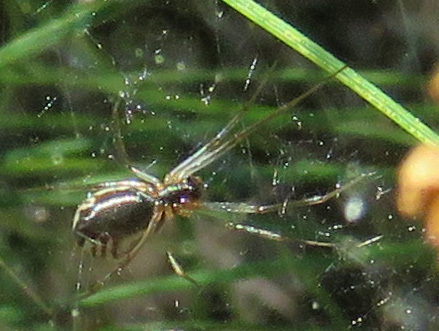 The tiny spider is easily overlooked in the large web, which often collects debris more conspicuous than the animal itself. Yes, I actually have a whole book on insects of just the Texas Lost Pines, which is a small district between Houston and Austin. There is no guidebook I won’t buy if I get a chance. A barely-there web, that looks more Doily-above-Bowl to me. The bowl with detritus more visible than spider. This book gives the Latin name as Frontinella pyramitala, which is a fun name to say, but BugGuide.net gives the Latin name as Frontinella communis, given by our friend Nicholas Marcellus Hentz in 1850. The black and white spider is definitely a Bowl-and-Doily. 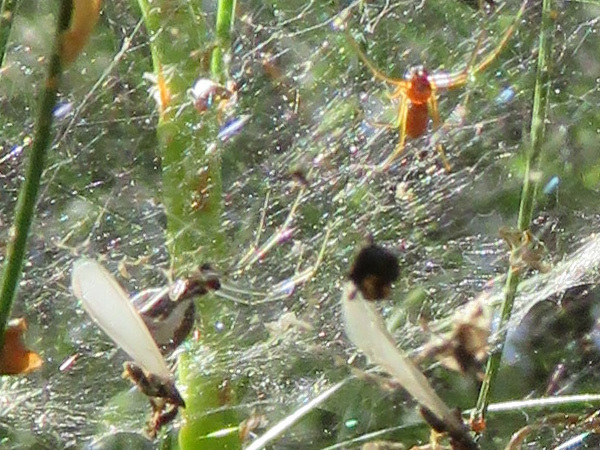 I am not sure if the thin reddish spider is a male, or an entirely different species. A 1985 research paper says that unlike most male spiders who do not eat during adulthood, the males of this species live on the webs that the females create, and then eat the food that is trapped, even though the females try to prevent them from doing so. The webs that I saw had plenty of bugs to go round. Close-up of the very tiny Bowl-and-Doily spider. 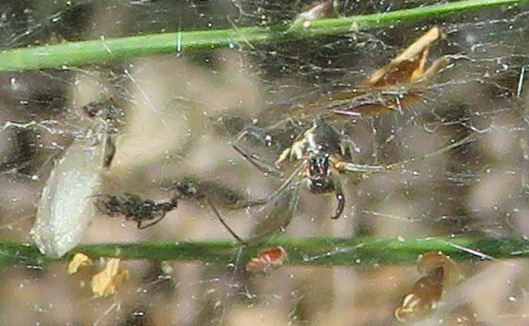 The spider among some of the insects and plant material trapped in her web. It occurs to me that, as I try to find and identify all the species on our farm, this little spider has done some of the work for me, by trapping insects I would not be able to on my own. I will be keeping an eye out for more of these wispy webs. Aww, so that’s who creates those light and wispy webs. Haven’t seen them here but have seen them out on camping trips and out walking in our rural area. Sounds like you have a good reference book…I need to get one for central area of Texas. Yes, I just thought they were the tattered remains of regular webs, I didn’t realize that they were a sign of this one species, until I read it. Sometimes I start from the actual creature, sometimes from a book! That is such a cool spider’s name 🙂 From the picture of its web, it certainly has been busy.